- or why you should use version control for your precious source code. A while back Jim Mckeeth tweetet a link to getAwesomeness - listing some nice Delphi projects on GitHub. Which brings me to the point of this post; a brief intro to the wonderful world of version control systems – and why you should start using one, if you do not already do. 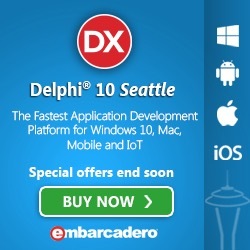 Delphi comes with build-in support for Subversion (since XE2), Git (since XE7) and probably others to be added later. A number of third party plug-ins exists supporting some of the other systems out there. I have used various CVS, VCS or DCVS over time – PVCS, FreeVCS/JediVCS, StarTeam, TFS, CVS, Subversion, Bazar and Git – and I am not an expert in any of these. I have meet people that do not trust version control system – even when they are fairly well integrated into their favorite IDE, they stick to copying folders and zip files. Even if you are a single developer just playing around for fun, you should get used to controlling your code using some VCS – it adds so much more to your toolbox/skill set – and is probably the single most important thing you need when coding. Based on Thomas Hensle's FreeVCS, which I have been happy using many years – it lacks more advanced features – but for small non-distributed teams it is sufficient – the source is in Delphi and you can chose your favorite database as database for the server application that runs on Windows (only) either as a service or an application. It integrates well into the Delphi IDE, but also has a standalone client and a diff tool (you can chose to use Beyond Compare that is included with the IDE – or something else you might prefer). A centralized version control system, that still in many places is the de facto standard, taking over the heritage from CVS – handles large teams – and even small teams or single developers might just setting up a NAS which offers a Subversion (svn) “package” out of the box – Synology products is one example. Embarcadero keeps their sample source code in a Subversion repository, so that you always can get updated and new samples whenever they are available. New kid on the block and is like Mercurial (hg), a distributed version control system, which is designed to handle distributed teams more efficiently, since the user has a clone of the full repository locally – he/she can work offline and just push/submit the changes made whenever online again. You can from Git access Subversion repositories, which could ease an eventual migrating to a more distributed workflow. Version control systems can control whatever digital assets you need to – but typically it is targeted source code and related files – since versioning and compare this type of data is more relevant – web pages are also source code. There are numerous clients – for use with all your other assets – I do like the Tortoise range which are free and available for both Git, Hg and Svn. Do spend a bit of time on getting acquainted with the terminology and idea behind the different systems you chose as candidates – and pick the one that fits your needs in tie to come. Having used a version control system also adds a valuable tool to your CV – getting into the flow and habit – seems to be hard for some people – so I think it is a point valuable point to show that you care the source code.